Al Arabiya exclusively interviewed four boys who were living under ISIS and representative of a center who aims to rehabilitate them. The children revealed details about the reality of life under the extremist group and how they came to join them as well as highlighting their military training procedures and the ideology that sustained the ISIS grip on power. 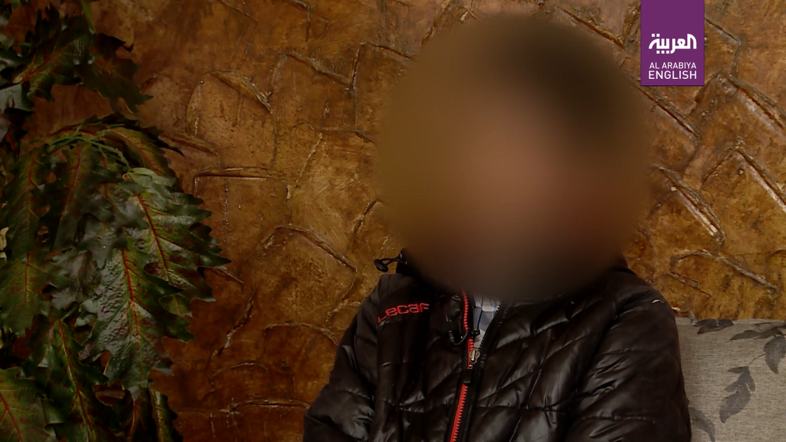 This is the full transcript of Al Arabiya's exclusive interview with former ISIS child fighter Mustafa. Mustafa, how old are you? I’m originally from Deir ez-Zor, but I live in al-Tabqa. How did you get to know ISIS? Was your father in ISIS? What was his role? Was he an Emir? A leader? He was an official in ISIS. And how did you get to know ISIS? Tell us. He took me to the first camp, then the second, then the third, then the fourth then I became an ISIS member. What were you doing in the camp? What were they training you to do? How to use weapons, and the lessons. My father was involved in that, I would just remove. Where were you trained? Tell me. Did they take you to Tell Abyad camp? Tell me about these camps and what are the differences between the one you went to and the camps for youth. There’s no difference, one has young people and one has adults. They took you to a camp? Which one? First they took me to the adults camp, then I went to the one for youth, then I went to another one for youth, and from there I went to one for adults, and became an ISIS member. Tell me something – the camp for adults, what did you do there? The trained us on weapons and gave us lessons. What type of weapons did you train with? You went through a lot of training to become an ISIS member. What are the types of training? Aside from what you’ve mentioned. Is there something else? Were there levels, were they training you using better weapons? In religion, what would they teach you? When you became an ISIS member, what would you do? I went to the battalion. What did you do when you were in the battalion? I was just in the battalion and then I moved to a checkpoint in Rif Hama and then my father came and I started working with him in decapitations. When you would see them decapitate people, what would you say? You weren’t scared the first time? And when you were scared what did they tell you? Nothing. I didn’t tell them I was scared. Why not? You didn’t perform decapitations. What did you do? I would just remove them. You remove them and do what? Take pictures? How many heads were decapitated in front of you, do you remember? Why did they decapitate them, did they tell you? They were with the regime? What did they tell you about people that weren’t with ISIS? The ones outside the state, what did they tell you about them? They didn’t use to say anything. Didn’t they used to say that those who are not a part of ISIS were heathens? Not all of them would say that. The ones that don’t pray. And the ones that don’t wear a hijab? Those aren’t related to heathenism. Where are they? Are they older, younger than you? Your mother – when you told her, you didn’t tell her you were scared? You didn’t want to say or you were too scared to say? I didn’t want to say. How long have you been in the center here? A year and four months. Are you comfortable, happy? Did anything change for you? Are you bothered by something? Do you feel more comfortable here or were you more comfortable in ISIS? A lot of things changed for me here at the center. I don’t see the same sights I used to see. The treatment here is better. What would the female slaves do at home? But you were home. The Yazidi girls that were with you at home – what would they do? I was a member of ISIS. Yes, but didn’t you have female slaves at home? What would they do? Clean, work, cook? Tell me exactly what they would do. They would clean and work. Who would beat them? Who did these female slaves belong to? Who brought them to your house? A man. He was imprisoned with me. The one that brought us the slaves was imprisoned with me. Imprisoned with you? Where were you imprisoned? Who were you imprisoned by? By the Syrian Democratic Forces. So you saw this man in jail later? He was your father’s friend? You had seven Yazidi girls. Your house fits seven? It was big? Not seven, we had three. Three, and what would they do? They would clean and work, only. They were good or not? Tell me. What would you feed them? Where would they sleep? The house was big? I was an ISIS member. What does that mean you were an ISIS member? You weren’t home? And where was your father? He was also an ISIS member. Who would stay at home? And the three women – are they Yazidi women or are they your father’s wives? Who would visit them – your father? You wouldn’t go with him? You don’t know them? How did you know there were three? My father’s wives told me. How did they tell you there were Yazidi women in a house? They told me they brought Yazidi women to the house. Would they leave the house or just stay in? They just stay at home. Did they ever cook for you? Is their food good? Do they clean properly? I don’t go to the house at all. Tell me how your life was like there? If you don’t play, now you’re 15, and you’ve been here for over a year so you were 13 when you came. What year did you join ISIS? Three years before you came here? What year do you remember? Which fronts did you go to with your father? Did you ever shoot something? You used a gun? Which battle or which area, do you remember? Were you good at using weapons? Did you shoot well? Did you see Abu Bakr al-Baghdadi since you father was an ‘Emir’? What would you hear about him? I don’t hear anything, we would just watch his clips. Your father – he never told you he saw him? How did your father treat you? Did he scream at you, hit you? Was he gentle? Your father would hit you? Yes, for example, if I am absent for three days from the ISIS members, he would hit me. Why would you be absent for three days? And when he hits you? I am forced to go back. What about your mother, you wouldn’t tell her if you’re happy or upset? What would you tell your mother? She wouldn’t be upset because of what you do? Your mom used to treat you well? How did your father join ISIS? Do you know anything? Do you remember? You don’t remember at all? Your father, before he joined ISIS, would use weapons? What did he work? Before the war? You don’t remember how you used to live? How your house was, big or small? Did you have everything? Who, other than your father, was with ISIS? What did your uncle do? Was he one of the security heads? I don’t go to him at all. But I was told he liked you a lot. When you go to visit him, how did he treat you? It depends. If I don’t come from ISIS, he doesn’t treat me well. If I come from ISIS he treats me well. Like what, what would he do? Like how? He takes you by car? He would give you a gun? Tell me. He takes me around by car. Would he give you a gun? No. I wouldn’t shoot people. I would go to the water and use it, only. To practice. When you went to the front – were you able to hold a large weapon or a small one? But maybe that one has a recoil, correct? And how were you able to hold it on your own? You were trained? I just used it to shoot twice. How did you come here? Did you surrender yourself or were you arrested? When you were first arrested, where did you go? I went to the center for investigation. How long were you in jail for? And then they brought you here? What bothers you here? What makes you happy? What do you feel is different? After coming here – what would you like to do when you’re older? I haven’t thought about that. There’s no way you haven’t thought about it, we all think about other nice things in our lives. I haven’t thought about it. Your father and uncle were arrested? My uncle died but I don’t know what happened to my father. Where did your uncle die? I don’t know anything about him. And your mother – do you see her? Does your mother know you are here? She doesn’t come to see you? Yes. She is currently at the camp. But my uncles (mother’s brothers) come and visit me. Your uncles weren’t with ISIS?